So far, the biggest challenge about the new house – if you ignore, for the moment, the virulent foliage – has been learning to operate the woodburning stove. Thus far, a woodburner has been an impossible, unattainable dream – much like owning a horse. I always wanted a horse so I could achieve that perfect accord between woman and beast. I mean, perfect accord with my dog basically equates to being permanently covered in slobber and earwax; whereas with a horse it’d be all gorgeous naturally highlighted hair and perfect, even, vaguely though not obscenely fluorescent teeth. And I haven’t even got onto the whips and leather boots and thighs that could crack a hazelnut with two decisive paces. Anyway. I was naturally thrilled to finally have free access to a woodburner. After a couple of days sitting around the living room admiring it, Husband and I decided to fire it up. Husband went to the shed and returned with a couple of logs and a stick. “So . . . how do you do it?” I asked. “Man. Make Fire!” said Husband confidently. I had no reason to doubt him. After all, man’s ability to conflagrate is innate, like navigating by the stars or farting Bon Jovi melodies in the lower ranges. Humans have made fire since dinosaurs were the preferred mode of transport – and these days, we have matches. Also, if Andrew were a superhero, his totally awesome superpowers (because I’m sure he’d have a selection rather than just the one) would DEFINITELY involve some combination of combustibles e.g. flame throwing, giant sparks, deadly fumes, and a backdraft that would make a random cross-section of spectators gasp in wonder. And the logo on his tight, shiny superhero costume would be fashioned of flames. Duly, I waited to be impressed. Andrew stuffed some newspaper and the logs into the stove in a haphazard arrangement of what we subsequently learned is called ‘the teepee’ method. Within seconds, an inferno blazed against the glass of the woodburner. Minutes later, it was a heap of smouldering ash, rustling and collapsing on itself. Undeterred – or perhaps more inspired by the cold snap – Husband adopted a new fire-starting technique. This involved lighting the kindling, then decisively flinging a gallon of diesel onto it. Now, YOU KNOW I like to be supportive of my husband, but regrettably I couldn’t in good conscience endorse this methodology. I love the flirtatious, playful smell of diesel as much as the next person, but I’m pretty sure it’s not environmentally friendly and splashing flammable fluid around is hardly the sort of example we want to set our child. Faced with the prospect of my dream fizzling out, I attempted to rekindle the dormant embers of information left over from Brownies. When that yielded no sparks, I read the Masport wood stove’s user manual cover to cover, and pretty much a degree course’s worth of Internet articles. Look, if you can get a BA in Golf Course Management and Meteorology – which I’m convinced is only a short step up from predicting horoscopes – I’m sure there must be a degree in making fire. Here, if you have a spare week to kill and think you know everything about woodstoves, check out this site for instant disillusionment. The most important thing I learned from my extensive research is the importance of using dry wood – which means we’re pretty much buggered, since I assume flash-drying wood with an oil heater rather defeats the purpose. Then I latched onto the theory that our grate was blocked with ash, so I cleaned it. ALL RIGHT I admit it: I made Andrew do it. This appeared to have little positive or even noticeable effect. In desperation, I became convinced that our flue (that’s modern terminology for a chimney) needed cleaning, but a call to the local chimney-sweep confirmed it had been serviced in April. So it may be blocked by a dead starling – but unlikely. AND THEN I came across an ingenious, confounding proposal: the upside-down or ‘top-down’ method of fire-building. According to The Internet, the top-down fire lights every time; produces less smoke; and uses less wood than the traditional method in the same period. Furthermore, whereas the conventional fire requires constant maintenance, the top-down fire allegedly burns for 4-8 hours without attention. 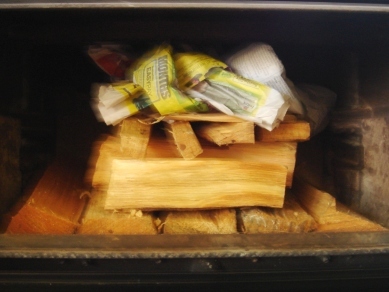 Instead of starting with newspaper at the bottom and layering up with kindling, sticks and logs, the top-down fire involves packing the heaviest material on the bottom and piling lighter material on top, ending with newspaper. Then you stuff any gaps with conventional wisdom, and light it. This is our version of a top-down fire. It didn't work but I had to give it a go because the newspaper knots at the top are called 'anna cracks' and how could any normal person possibly resist that? After our first attempts at building a top-down fire failed I gave up because I have no resilience. But Andrew persevered with a modified version, which I call the ‘top-down-bottom-up-tee-hee-pee’ method. This is basically a small teepee arrangement atop two rows of closely stacked logs. Which appears to work a treat. Or he might still be tossing a bucket of diesel on the kindling when I’m not looking. er…I don’t think humans and dinosaurs ever co-existed. Not that I’m being picky of course. On the bright side, in a couple of years you’ll have your own Asset whom you can shove up the flue to clean it. It’s traditional. And I know you’ll be pleased to know: you can in fact get a degree in astrology. That refers to the degree in astrology, not sending The Asset up the flue. In less than three months time, we can always tie the kid onto the end of a broom handle and stuff him up there. Only joking; of course it’s more humane to use the dog.